Six Thinking Hats method was created by Edward De Bono as a model for explore different perspectives towards dealing with a complex situation, problem, or challenge. It is a simple, effective thinking process that helps you be more productive and focused when dealing with a situation. The Six Thinking Hats is a technique used to look at situations from different points of view. This technique helps you move away from habitual thinking styles and towards a broader view of a situation or problem. The process encourages you to deliberately use six different modes of thinking where otherwise you may be trapped by only one way of thinking. You cannot be emotional, objective, logical, and creative all at the same time. 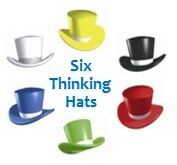 The Six Thinking Hats method allows you to focus your thought process. By wearing a specific colored hat, you focus on that particular mode of thinking. By switching “hats,” you can easily redirect and focus your thoughts on a different mode of thinking. There are six different imaginary hats that you can put on or take off. Each hat is a different color and represents a different style or mode of thinking. You can put on or take off one of these “hats” to indicate the type of thinking you are using. When you change your hat, you change your thinking. Red hat: emotional view and feelings. It deals with emotions and hunches. 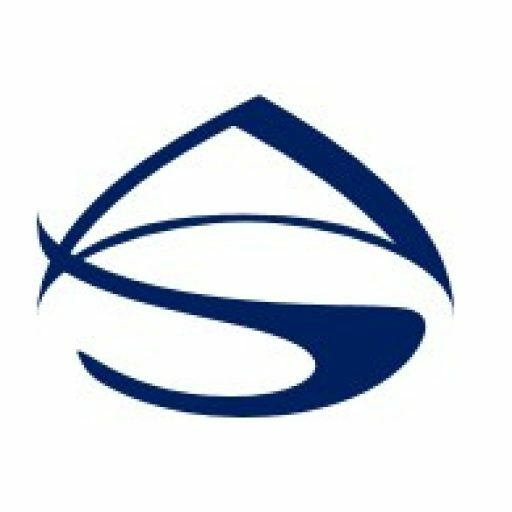 Black hat: caution, judging, and evaluating. It points out weaknesses in an idea. Green hat: creativity and new ideas. It is an opportunity to discover new concepts. Blue hat: big picture, cool and controlled. It used to manage the thinking process. The hats are just visual cues to allow you to easily switch your mode of thinking. By putting on and taking off these imaginary hats, you switch from one type of thinking to another. For example, you may use the green hat to generate ideas, and then use the black hat to vet the ideas by evaluating them. This techniques can be very effective in group discussions on addressing a situation or problem. 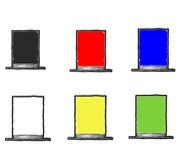 A specific colored hat may be used to request the group to direct the discussion toward a specific mode of thinking such as creative or logical. This technique ensures that all the people in the group are focused on and thinking about the same subject in the same way at the same time. Therefore, when done in a group, it is important that everybody wear the same hat at the same time. You do not want one person generating ideas when another person just shoots those ideas done.